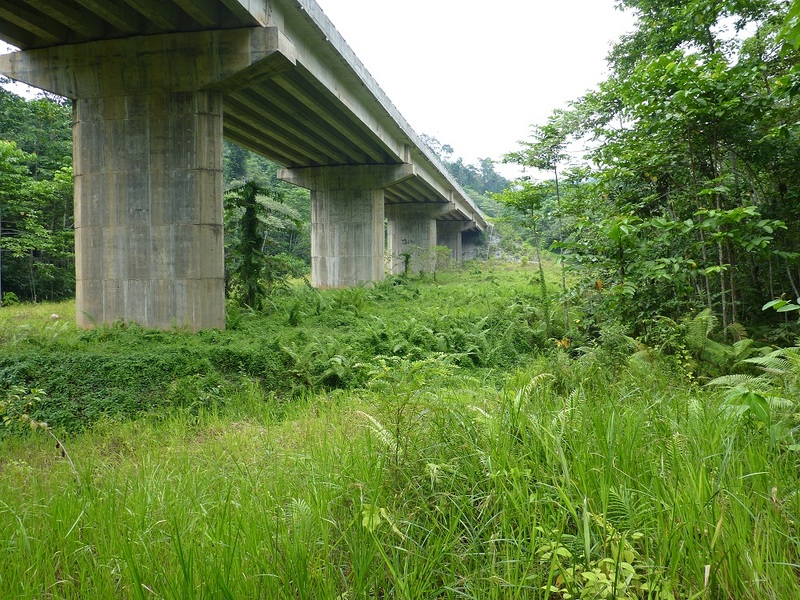 Project description: Several highway underpasses (some termed as ‘eco-viaducts’) have been built by Malaysian road authorities along highways with the intention of helping mammals to cross underneath highways safely. Several studies that have quantified the effectiveness of highway viaducts as wildlife crossing structures have only been conducted in temperate countries such as Canada – none have been conducted in the tropics so far. As such, we do not know whether underpasses in tropical countries such as Malaysia can help reduce mortality, nor have any telemetry studies been conducted locally to characterise animal movement patterns through these viaducts. This project evaluated the effects of 20 highway underpasses (in Perak and Terengganu) on large mammal movement in Peninsular Malaysia. The focal taxa includes seven large mammal species: Malayan Tiger (Panthera tigris jacksoni), Asian Elephant (Elephas maximus), Asian Tapir (Tapirus indicus), Barking Deer (Muntiacus muntjak), Sambar Deer (Rusa unicolor), Serow (Capricornis sumatraensis), and Wild Pig (Sus scrofa). The project had strong field ecological and applied conservation policy components, with the latter contributing to Outcome 4 of the National Tiger Action Plan for Malaysia and the Central Forest Spine (CFS) Master Plan for Ecological Linkages. Fieldwork was conducted within priority areas for tiger conservation in Peninsular Malaysia, as well as two primary ecological linkages (Primary Linkage 7 in Terengganu and Primary Linkage 8 in Perak) identified in the CFS Master Plan. Suggested improvements were also proposed to build more effective wildlife crossings if current highway viaducts are ineffective. This project has now been concluded. It found that underpasses only had limited effectiveness in mitigating the impact of roads on wildlife. 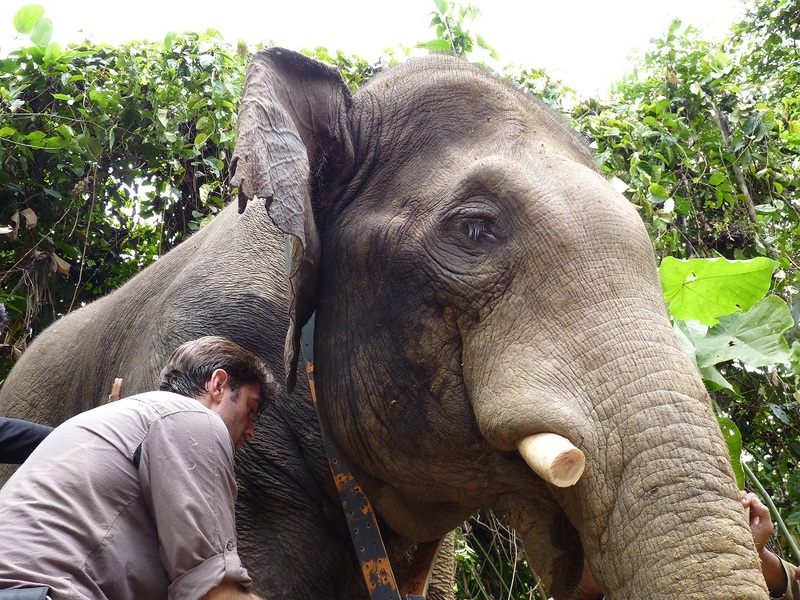 Based on a huge camera trapping survey effort (38,631 trap nights from 340 camera trap locations), it appears that all 20 underpasses could potentially be effective crossing structures for only one of the seven large mammals species – the Asian Elephant (i.e. the number of detections of elephants in the forest was similar to that of each underpass). However, we have no evidence that the elephants used the underpassess to cross the road. Underpassess were also not effective crossing structures for three large carnivores – Malayan tiger, leopard and clouded leopard. Tiger individuals were detected on either side of the road, but were never photographed under the underpassess – this means that they never used the underpasses to cross the road. In fact, a leopard roadkill was found on the road above one of the underpassess during this study. Unfortunately, roads and viaducts can also provide encroachers greater access to adjoining forests. In fact, campsites and photographs of people with guns were detected under many of the 20 underpasses. Therefore, wildlife crossings should not be touted as a universal mitigation solution for road development, and given their exorbitant cost, Rimba’s official position at this point in time is that we cannot recommend underpassess or overpasses as a viable mitigation option for large mammals in Malaysia, particularly for new road projects being planned. Our view is that it is preferable to not build the road in the first place – and that, wherever this is unavoidable, road user management should be implemented instead, involving measures such as speed cameras, speed bumps, speed-reducing strips, warning lights, wildlife signs, and if feasible, road closures during the night. The results of this project are in the process of being published in peer-reviewed journals. The project’s work to protect the corridor has been continued in other forms, first via Project Black Cloud and now via Harimau Selamanya. This short-term project was funded by the Mohamed Bin Zayed Species Conservation Fund to evaluate the effectiveness of scent-baited traps to obtain hair samples from Dhole/Asiatic Wild Dog (Cuon alpinus) and other threatened carnivores in the Kenyir Wildlife Corridor, for the purposes of population genetic studies. Population estimates of dhole in Peninsular Malaysia have yet to be determined, in part due to their low detection rates in rainforests. Without sufficient knowledge on their conservation status, it would be difficult to prescribe specific management interventions to help conserve this species. 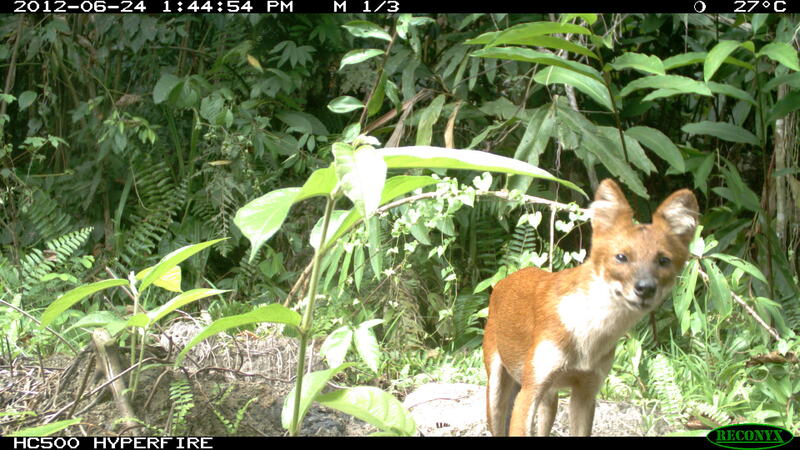 During our camera-trapping surveys, a group of five individuals was recorded in the Kenyir Wildlife Corridor. Apart from this species, other threatened (i.e. Endangered and Vulnerable IUCN threat status) carnivore species that can be found in the same habitat include the Malayan Tiger (Panthera tigris jacksoni), Clouded Leopard (Neofelis nebulosa) and Marbled Cat (Pardofelis marmorata). Unfortunately, this corridor is threatened by potential conversion to rubber plantations and infrastructure, and gathering more information on the conservation status of dholes and other carnivores can be used to justify calls for gazettement of this corridor as a ‘no-conversion’ area. Unfortunately, scent-baited hair-trapping was found to be unsuitable for the collection of hair samples from dholes in Malaysia, in part due to this species occurring at very low densities within the landscape. This method may also be unsuitable in areas with significant elephant presence as there does not appear to be any way of securing the hair traps against damage by elephants (Elephas maximas). Nevertheless, this technique requires further investigation, as positive rubbing responses were recorded for tigers and clouded leopards. However, not all individuals responded, and therefore this method may be inappropriate for mark-recapture population monitoring due to the possibility of false non-detections. Thus, scent-baited hair-trapping may only help answer certain ecological questions such as understanding the genetic diversity of individuals within certain carnivore populations. The dense tropical rainforests of Peninsular Malaysia are home to three enigmatic and beautiful big cats – Malayan Tiger (Panthera tigris jacksoni), Leopard (Panthera pardus) and Clouded Leopard (Neofelis nebulosa). All three are globally threatened with extinction; classified by the IUCN Red List as ‘Endangered’, ‘Near threatened’ and ‘Vulnerable’ respectively. While much research has been carried out in Malaysia in order to improve our knowledge of the largest and most threatened of these cats – the Tiger, to date there have been few studies focused specifically on either Leopard or Clouded Leopard in Peninsular Malaysia. Consequently, very little is known about their regional conservation status in Malaysia or basic ecological information. Many studies have employed camera traps to individually identify tigers using their unique stripe patterns. However, unlike anywhere else in the world, the population of leopards in Malaysia is almost entirely composed of individuals with black coats. Whilst they still possess the spots and rosette patterns that ‘yellow’ leopards elsewhere around the world display so vividly, these are masked by the uniform black colouration of their coat. Conventional camera traps that rely on a flash to illuminate the subject are unable to show these patterns in their photographs. However, by using a strictly infrared flash, the patterns hidden within the coat are revealed. With this new technique we could now begin to undertake research to finally understand more about these big cats (for further discussion, see this Mongabay article). Project Black Cloud focused on these melanistic leopards and clouded leopards. 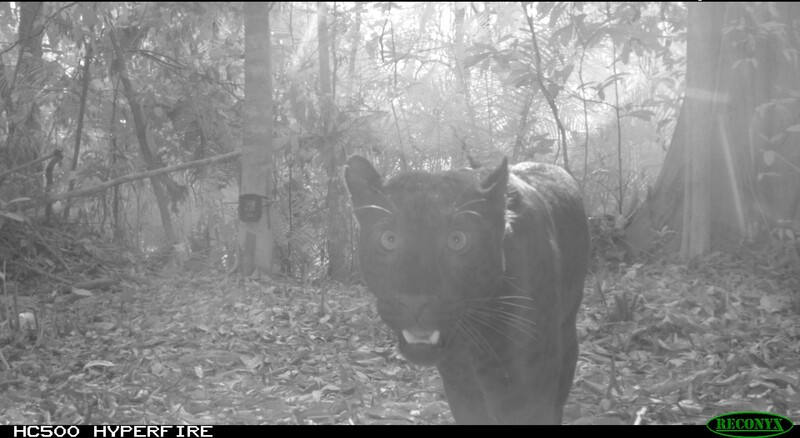 We deployed double-sided camera trap stations over an area of roughly 150km2 in the Kenyir Wildlife Corridor. From the data collected, we determined the density of both species’s populations in the corridor. Other information may include how the highway that bisects the corridor affects these animals, and whether their activity patterns are correlated with any potential prey species. As tigers continue to disappear from landscapes across their range, information on other large carnivores occupying the same habitat may become increasingly valuable – for instance to determine whether these other carnivores might potentially occupy the niche that has been vacated by tigers. We hope that apart from providing vital information to shed light on these less understood carnivores, this project can also provide support for our ongoing efforts to gazette the Kenyir Wildlife Corridor as a protected area. This project has now ended and the results are in the process of being submitted for publication in peer-reviewed journals. Its work continues via the Harimau Selamanya project. Project description: We have set up a ‘Lifedesk’ on Malaysian terrestrial molluscs under the Encyclopedia of Life Program. 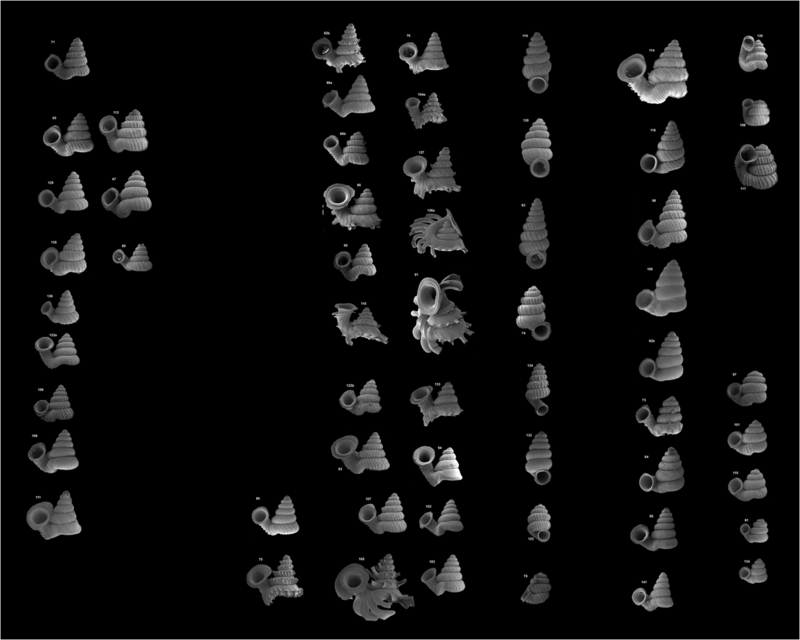 This online database contains information on Malaysian terrestrial molluscs from literature and reference collections. In the end, we hope to complete a corpus of literature for each land snail species from Malaysia for public access on the internet. This endeavour will allow scientists and the public to better understand molluscan systematics through the development of identification resources and tools to manage molllusc classifications and synonymies. In addition to the assembling of photographs and literature database, general species descriptions, ecological information and taxonomic status will be provided for each species. We welcome suggestions, participation and any information that will enrich this database. Project description: Peat swamp forests are one of the most unique, but at the same time, one of the most critically imperiled ecosystems on Earth. Despite being rich in fish species — many of which are strict endemics found nowhere else — Southeast Asian peat swamp forests are being lost at unprecedented rates. While previous studies have surveyed the fish communities in the peat swamps of Peninsular Malaysia and Sarawak, the ecology of peat swamp fishes with respect to their spatial/temporal species richness patterns, community structure, and response to habitat degradation remains unknown. In this project, we hope to fill these knowledge gaps by studying fish communities across different land use types across flooded rivers of peat swamp forest (commonly known as blackwaters) in Sarawak and Sumatra. First, we examine the environmental factors that structure fish communities in intact peat swamp forests in both dry and wet seasons. Second, we will examine if species richness and community composition change across blackwaters in different stages of the peat swamp forest. Third, we will evaluate the impacts of logging and oil palm plantation conversion on peat swamp fish communities. Finally, we explore options such as buffers to mitigate any negative impacts of land use on those fish communities. Our study represents the first attempt to understand the impacts of land-use change on the unique fish biodiversity of peat swamp forests and elucidate how fish communities are structured across different stages of a peat swamp forest. Our work on mitigating the impact of oil palm agriculture will also help to inform policy aimed towards preserving biodiversity while fulfilling concomitant human development goals. 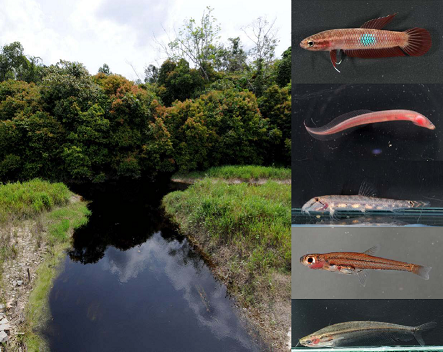 As peat swamp forests are underexplored, it is likely that new fish species will be found in our project especially given recent discoveries of the world’s smallest fishes in the peat swamps of Sarawak and Sumatra. By advancing the hitherto limited ecological and conservation knowledge of peat swamp forests, we hope our study will contribute toward the continued preservation of this highly imperiled habitat and its unique fishes. Project description: The ‘Management and Ecology of Malaysian Elephants‘ — or MEME — is a research program that aims to (1) assess the effectiveness of current elephant management policies in Peninsular Malaysia, (2) develop a practical long-term management strategy based on scientifically sound knowledge of elephant behavior and ecology, and (3) build local capacity to produce a new generation of wildlife researchers and managers of high scientific caliber. You can find out more about MEME by contacting Ahimsa directly. MEME also have their own website and Facebook page, or you can download the quarterly MEME Updates.